Human beings are the focus of this second collection of articles by David Chambers, which also contains two studies published for the first time. 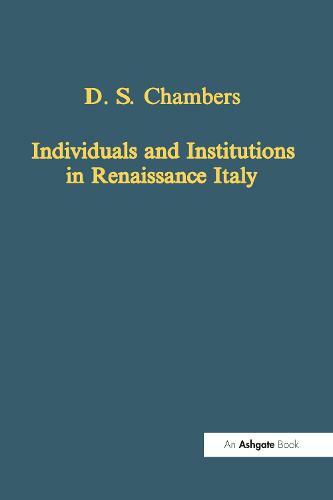 Constructed from a vast array of original sources they explore personal experience and motivation in connection with the public life of Renaissance Italy, including educational institutions (the universities of Rome and Pavia and early academies), political institutions and relations (concerning Mantua, Trent, Urbino, Venice and England), religious institutions (with particular reference to to the election of popes) and social or case histories. Particular topics are the account of a Mantuan embassy in 1557 to the court of Queen Mary, an unknown letter of the humanist Vittorino da Feltre, two studies about the prolific but enigmatic Venetian chronicler Marin Sanudo, an essay on the Marquis of Mantua's dubious reputation as 'liberator of Italy' in 1495, and a discussion of prophetic mystery associated with two wall paintings in the Sistine Chapel. Appendices of documents and additional notes accompany many of the studies.